An amazing photo – all the textures! Where’s the Pacific? This is a nice photo, but I don’t see it as a spit. Where’s the long shore drift? Chris T.
I always put my photos’ location, of where I found the image next to the image itself. It’s not an explanation of what you’re seeing, it’s an explanation of “where”. Get it? I can tell you what you’re looking at, if you want. Otherwise, there’s 100s if not 1000s of images of the spit itself, views, the jetty, on the web. This is one sweet pic! Very interesting point of view of this amazing photo, Elan! Wow. . . I get it. Bye. Intriguing! Fantastic photograph, dear Elan. I like your unexpected caption as well as the picture. Thanks. 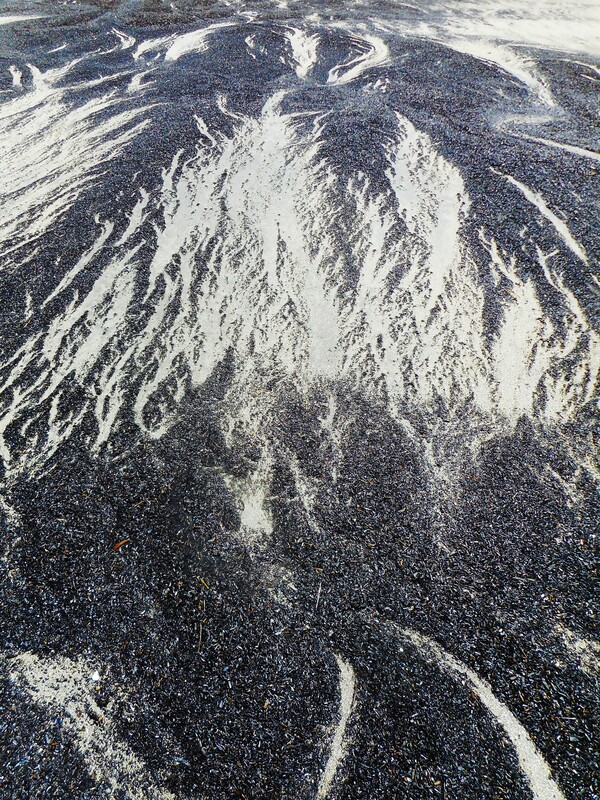 This photo is of the sand on the beach right before the river meets the ocean. Thanks to tides meeting river current, particles, such as wood bits, sticks, and other debris washed ashore. If you look closely at the dark parts, you can see them. The patterns are made by the wind, which is always present on the spit. You can see how the wind has swept back the debris, revealing the sand underneath, the lighter parts of the photo. That’s what created the design that looks like flames. There is no water in this photo. It’s directly behind me as I took the picture. That’s amazing how natural works, makes such beautiful natural art. Thanks for pointing out the highlights, I enjoy looking at your photo.